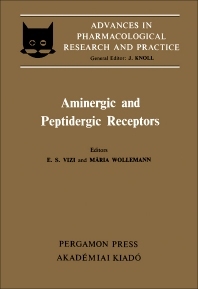 Advances in Pharmacological Research and Practice, Volume VII: Aminergic and Peptidergic Receptors focuses on how neurotransmitters, drugs, and hormones affect the plasma membrane. Composed of 14 chapters, the book outlines the manner by which presynaptic receptors involved in chemical neurotransmission function. The text then presents various laboratory experiments done to animals to determine how these receptors affect the plasma membrane of these subjects. One of the internal body parts examined is the heart. The variation in sensitivity of opiate receptors is also discussed, focusing on the effect of opioid peptides and morphine on the nigrostriatal axon terminals. The book also discusses the biochemical and pharmacological assets of opiate receptors among mollusks; the upshot of peptides upon biogenic amines of the central nervous system; and how gastrin analogues affect the gastrin receptor of the stomach. This book is a great find for highly trained scholars in the field of receptor research, including biochemists, chemists, pathologists, morphologists, physiologists, and pharmacologists.